If you’re planning to wear a suit — whether it’s for a job interview, business meeting, wedding, graduation or any other formal occasion — you’ll need to pair it with the right dress shirt. A traditional two-piece suit only consists of trousers with a matching suit jacket. Therefore, failure to include a dress shirt in your outfit will hurt your efforts to create an attractive, cohesive formal outfit. But not all dress shirts are made equal. To create the perfect look, you must choose the right type of dress shirt, which is something that we’re going to discuss in this blog post. Do you want a dress shirt with a pattern or without a pattern? It’s not uncommon for men’s dress shirts to feature checkered or polka-dot patterns. The former is a more subtle pattern, whereas the latter offers a bolder appearance. Keep in mind that patterned dress shirts have a tendency to look more casual than non-patterned dress shirts, so only choose a pattered shirt if it’s appropriate for the occasion during which you intend to wear it. Dress shirts are available in dozens of colors, ranging from basic colors like white and black to bright colors like red and orange. A good rule of thumb is to choose a dress shirt in a color that contrasts with the color of your suit. If you’re wearing a black suit, for example, you can’t go wrong with an all-white dress shirt. Because white contrasts with black, it’s an excellent combination that’s guaranteed to improve your look. Of course, you should consider the fabric from which the dress shirt is made. Cotton is undoubtedly the most popular fabric for men’s dress shirts. It’s soft, supple, durable and able to withstand countless years of use. However, there are countless other fabrics used to make dress shirts, including linen, silk, polyester, broadcloth, Poplin, Royal Oxford and more. Each fabric has its own characteristics, with cotton and linen being among the most versatile. Choose a dress shirt in a fabric that’s comfortable and appropriate to wear with a suit. If you don’t like cotton, linen is a viable alternative that works well with suits. Arguably, one of the most important things to consider when choosing a dress shirt to wear with a suit is the fit. In other words, how does the dress shirt fit your particularly body? No two men have the same body type. Some require dress shirts in a smaller or larger size than others. If you wear a dress shirt in the wrong size for your body type, it will look awkward and probably be uncomfortable to wear. So, don’t make the mistake of choosing a dress shirt in the wrong size. Make sure it fits properly in the neck, torso and arms before pairing it with your suit. Pay attention to the collar when choosing a dress shirt to wear with a suit. All men’s dress shirts have collars, but the way in which these collars are designed varies depending on the shirt. The spread collar, for example is the most common type of collar found in men’s dress shirts. It’s simple, clean and is easy to use with a necktie. But there are other types of collars as well, including the straight point collar, cutaway collar and button-down collar. Don’t worry too much about the names of the collars. Rather, choose a dress shirt with a collar style that flows cohesively with the rest of your suit. In addition to the collar, you should also pay attention to the cuffs when choosing a dress shirt to wear with a suit. The section of fabric around the wrists, the cuffs affect both the comfort and appearance of a dress shirt. 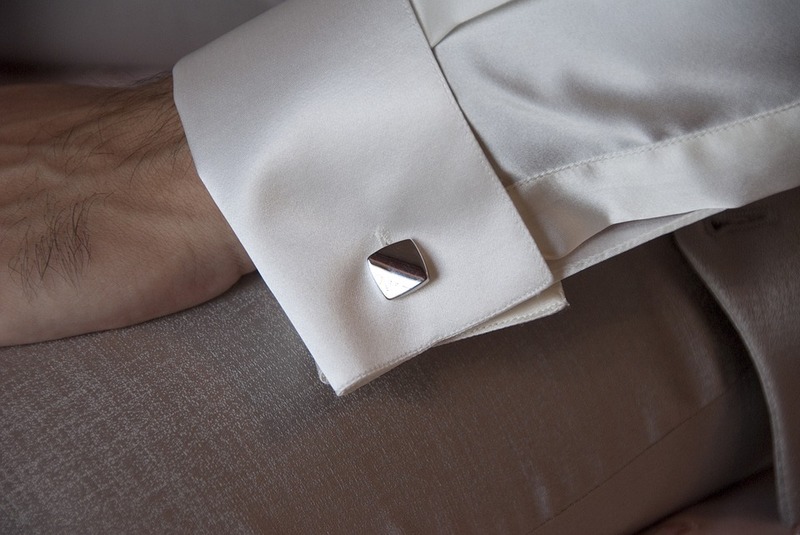 The most common cuff style for men’s dress shirts is known as the one-button barrel cuff. As the name suggests, it’s characterized by the use of a single button around the wrists. It features a clean, crisp appearance that looks great with all types of suits. All garments require at least some maintenance, and dress shirts are no exception. When choosing a new dress shirt, check the care label to determine what steps are required to clean and maintain it. Some dress shirts are dry clean only, meaning you cannot safely place them in the washing machine or clothes dryer. Instead, you must take them to get dry cleaned. Other dress shirts, however, are perfectly suitable for the washing machine. 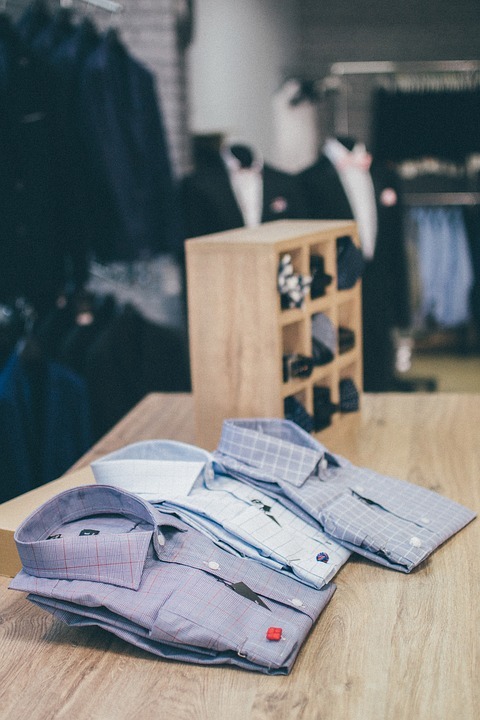 You don’t have to necessary avoid dry clean only dress shirts, but you should consider the overall work required to clean and maintain a dress shirt. Your dress shirt should flow cohesively with the suit with which you wear it. If your dress shirt features an entirely different color, style or overall design than your suit, it will create a poor appearance. So, how do you know whether a dress shirt flows cohesively with your suit? The best way is to try them on together. This isn’t always an option, however. If you can’t try on a dress shirt with your suit, envision yourself wearing the outfit and ask yourself if it matches. If it doesn’t match, you should choose a different dress shirt or suit. Finally, consider the brand when choosing a dress shirt. Just like different suits are made from different brands, so are dress shirts. You can expect to pay more for a dress shirt from a premium brand than a dress shirt from an unknown brand. However, the difference in quality between the two can be akin to night and day. Premium brand shirts are designed with a superior level of craftsmanship. Therefore, they tend to look better, feel better and last longer than their counterparts from unknown brands. If you’re willing to spend the extra money, you’ll find that buying a premium brand dress shirt is well worth the investment.